This week’s recipe for French Fridays with Dorie just screams “Springtime!” It’s light, flavorful, and bursting with asparagus flavor. The soup consists of asparagus (lots of it), onion, garlic, shallot, leeks, olive oil, butter, salt, and white pepper. I started by snapping the asparagus to remove the woody part at the base, then peeling the stalks (seriously, who does that?). I tied the peels and stems in a cheesecloth, then boiled the asparagus, stalks, and peels in boiling water. I removed the asparagus after about four minutes, reserving the water and discarding the stalks and peels. Next, I heated olive oil in the pot. I was using a butter-infused olive oil, so I left out the butter called for in the recipe. I added the onion, garlic, shallot, and leeks, salted and peppered them, and cooked them low and slow until they were soft and glistening. I added back six cups of the asparagus water, simmered for a while, then dropped the asparagus back in. After everything had cooked a bit more, I puréed the soup in two batches in my Vitamix. I thought the first batch looked a bit too watery, so I left most of the liquid out of the second batch. When I mixed it all together, it was a beautiful color and consistency. The recipe says that the soup can be served hot or cold. I wanted to try it right away, so I served it hot with a dollop of sour cream and a drizzle of olive oil. I found it slightly bland, but a little sprinkle of cayenne pepper solved that problem. I’m interested to try this soup cold, but I really enjoyed it hot. It was smooth, silky, and brimming with Springtime flavors. It’s winter here in Australia so I had it hot as well, I’m curious about how it would taste cold as well! Yes, you get bonus points for following the recipe. The soup did need a little more seasoning than the recipe called for – I am pretty sure I added extra; but I was so far off the recipe that I don’t remember what I did. I was surprised that, with all those aromatics and plenty of salt and pepper, the soup was still bland. 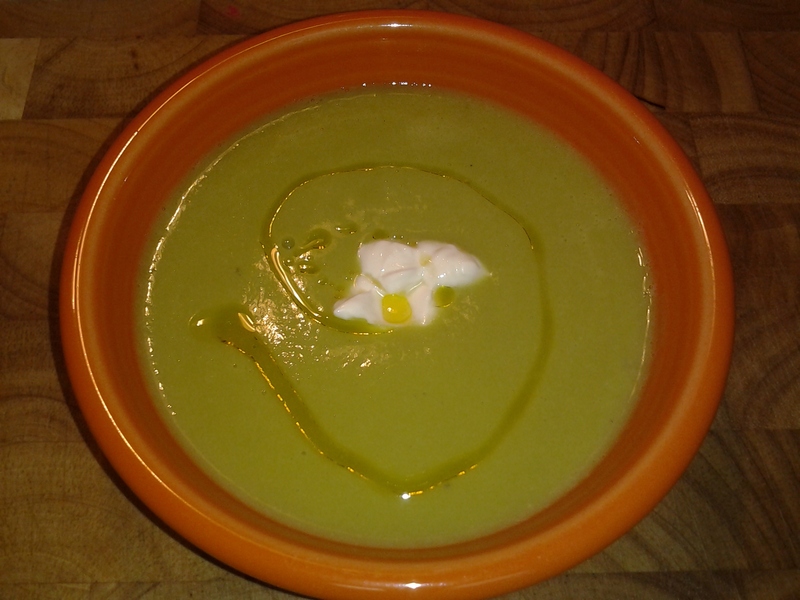 I love your soup with the olive oil! 🙂 it looks really, really great! Your soup looks great! Kudos for actually following the recipe – I couldn’t be bothered with the peeling, and being fancy about the stock. Love the idea of the oil – I have some chile oil that might be great. I served mine hot with home made corn muffins. Pretty tasty, though I’ll be having the rest cold – when I tasted it, I liked it better that way – oh, and with your idea of some chile. It needed something. I don’t think I’ll bother with the peeling next time. And I might use either chicken or vegetable stock for added flavor. All in all, still a really nice soup. Beautiful! We ate ours hot too, and loved it. I ate it hot, cold, and at room temperature, and liked it all three ways. Looks great…and very fancy with that dollop and swirl! Thanks, Kayte. It was simple, delicious, and fancy to boot! It seems that a lot of people were peeling asparagus this week, but my thought was just like yours. Who does that? I did not. It worked out fine. I think if you had older, woody asparagus, you might want to peel it. But it just seemed like too much work, especially since the Vitamix can puree anything. I think this soup was ok hot – I am not a cold soup person. I loved it hot, and liked it well enough cold, too. Thanks. I found some recipes online for pistachio oil. I would be interested to see how the olive oil-based recipes compare with pressed pistachio oil. It’s probably less intense, but I couldn’t justify buying a bottle of oil I’d likely not be able to use up before it went off. We’ll see! We enjoyed it cold and thought that it was a bit bland as well. I might roast the asparagus first rather than blanching them next time, although the colour might not be that beautiful hue of green. Love the oil swirl on your soup. I’m excited to try it cold for lunch tomorrow. Roasted apsaragus would be great, and well worth the loss of “green”. It definitely needed something. I think next time, I’ll use chicken stock.